Newtown, PA. (March 1, 2018) – CenTrak, the 2017 and 2018 KLAS Research Category Leader for Real-Time Location Systems (RTLS), announced today the addition of IRUS™ hybrid locating technology to its Internet of Things (IoT) location and sensing offering. 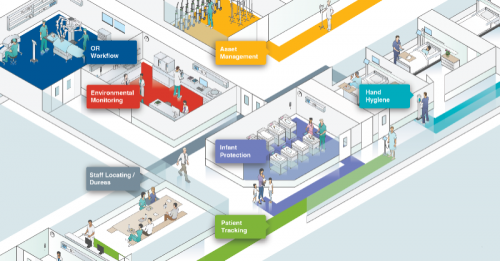 IRUS™ was specifically developed for use cases requiring Clinical-Grade Locating™ in open spaces, such as infusion areas, preoperative and post-anesthesia care units, and emergency departments. IRUS supplements an already diverse Enterprise Location Services platform, and brings increased flexibility with highly accurate sub-room location segmentation, at update speeds measured in seconds. The combination of technologies drives the most demanding location-enabled clinical solutions, including: hand hygiene monitoring, rounding compliance, contact tracing and nurse call automation. The patented blend of Gen2IR™ and Advanced Ultrasound provides the accuracy and speed necessary for automating clinical workflow and improving patient care. IRUS™ reduces total cost of ownership, requiring less infrastructure compared to legacy systems. The synthesis of the technologies also overcomes interference challenges experienced using ultrasound locating in buildings with commercial lighting control systems. IRUS is interoperable with CenTrak’s extensive line of waterproof tags, including the 31-day patient tag designed without seams, screw holes, or crevices for easy sterilization. IRUS™ infrastructure may be wired or battery-powered with a 5-year battery guarantee and are supervised and configurable using Connect™, CenTrak’s configuration, system-health monitoring and advanced battery management platform. The technology can be deployed in conjunction with other native CenTrak technologies including Bluetooth Low Energy (BLE), Wi-Fi, Low Frequency (LF), active UHF and passive RFID. CenTrak will be exhibiting at HIMSS 2018 in Las Vegas. Visit CenTrak’s booth #7221 to participate in demonstrations and to learn more about CenTrak’s Enterprise Location Services. For more information, visit HIMSS 2018. CenTrak improves healthcare operational efficiency and the quality of patient care via the industry’s most robust and scalable Enterprise Location Services™ offering. Ranked #1 as the 2017 and 2018 KLAS Category Leader for Real-Time Location Systems (RTLS), CenTrak’s technology supports high velocity updates and sub-room level accuracy across the entire healthcare enterprise. In its mission to transform patient care, CenTrak helps world-class healthcare facilities increase productivity, streamline workflows, drive higher patient and staff satisfaction and reduce costs. For more information, visit CenTrak.com. IRUS™, Enterprise Location Services™, Gen2IR™, CenTrak Connect™, Clinical-Grade Locating™ are trademarks of CenTrak®, Inc.